Taco Bell has apologized to customers who were mistakenly told they'd won draws for a PlayStation Vita, but that may not be enough to keep the company out a legal hassle. If you're a Taco Bell connoisseur, you've probably noticed the PlayStation Vita contest that's been ongoing for the past several weeks. It's all pretty simple: buy a Taco Bell Big Box, punch the code on the box into the Taco Bell website, then sit back and cross your fingers. There's a winner every 15 minutes! But some of those "winners," Taco Bell now says, weren't actually winners at all. The trouble first came to light a couple of weeks ago, when a number of customers began complaining that they'd received winning notifications but were subsequently ignored, even after making contact with the company. Several were told it could take a few days to verify their entries, but little headway was made until Taco Bell sent a statement to Kotaku suggesting that shenanigans were afoot. "The Unlock the Box promotion has been tremendously popular with consumers who want to get their hands on a Sony Vita but unfortunately a small group of people have tried to game the system," it said. A later statement clarified that position slightly, claiming that nearly all complaints were "from people who had the URL for the winner's page but who did NOT have winning entries." The company said it was continuing to work to ensure that all legitimate winners received Vitas, and several members of a "Taco Bell Vita" Facebook group have stated that they have in fact received their systems. And now the bad news: Taco Bell has confirmed that the errant winner messages were in fact triggered by someone dicking around with the system. 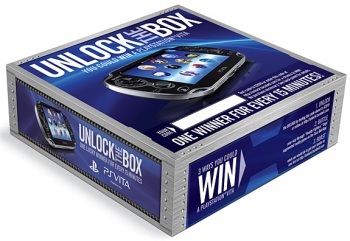 "We have learned that during a short period of time on January 30th, some people entering our 'Unlock the Box' promotion erroneously received a message suggesting they had won a PlayStation Vita, pending verification," the company said. "It was confirmed these entrants viewed these messages as a result of others who attempted to gain illegal entry and defraud the system. Unfortunately, during this time period some saw a confirmation screen but were not valid winners." To make up for it, everyone who received a false positive winner's message will be entered into a separate draw for a second shot at a PS Vita. That probably won't be enough to keep the aggrieved customers happy, though; talk in the Facebook group has taken an entirely unsurprising turn toward lawsuits and attorney Eric Ratinoff said that regardless of the circumstances that led to the false notifications, Taco Bell has an obligation to deliver the goods. "If Taco Bell had a problem with the way they ran their own sweepstakes, that should be their own problem," he said. The "Unlock the Box" contest is ongoing and runs until March 11. Source: MCV, thanks to chronobreak for the tip.